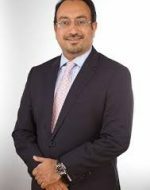 Amyn Mussa is a partner and head of the energy and infrastructure group at Anjarwalla & Khanna (A&K), one of the premier law firms in Kenya and East Africa. Under Amyn’s leadership, A&K has developed a dynamic energy practice and is regularly engaged on the most significant power and infrastructure projects in Kenya. Amyn acted for the sponsors of the 310MW Lake Turkana Wind Power Project (LTWP), the largest power generation project in Kenya. LTWP won the Project Finance International Award for African Renewable Energy Deal of the Year 2014, as well as the African Renewables Deal of the Year at the IJGlobal Awards 2014 for Europe & Africa. He also acted for the government of Kenya on its first ever PPP coal concessions. Amyn’s clients include Quantum Power, General Electric, Ormat, Transcentury, Symbion Power, IFC, AIIM, Mitsui, Toyota Tsusho and Google. With over 18 years of experience, Amyn is consistently recognised by international directories, including The Legal 500, IFLR1000 and Chambers Global, which identified him as “one of the leading guys in energy work in Kenya” (2014) and praised him for “his energy and projects expertise” (2015). Amyn has also handled groundbreaking real estate projects in the region, including Two Rivers, Centum Investment’s 100 acre mixed-use development, the largest of its kind in Kenya, and Garden City which will include the largest retail outlet in Kenya. In addition, Amyn is active in the oil and gas sector, representing leading companies such as Tullow and Africa Oil. Amyn is an advocate of the High Court of Kenya and graduated from the University of Houston Law School.